In 1683, Stephanus Van Cortlandt, with a license issued by the Royal Governor of New York, made his first purchase of land from the Indians. On June 17, 1697, the British King William III granted him a patent for the Manor of Cortlandt, which at this point encompassed roughly 80,000 acres of land. The Manor house was located north of the confluence of the Hudson and Croton Rivers. A colonial census taken in 1712 shows that there were only 91 people living on the entire manor,[iv] and they lived close to the Hudson. Stephanus Van Cortlandt died at the turn of the century, but it was not until 1730 that his manor lands were divided among his heirs and some of the Great Lots, as they were called, were put up for sale. After 1730, settlers from the southern part of the colony and from Connecticut migrated to the Manor. Although mostly of English extraction, settlers also included French Huguenots and blacks. Many of these newcomers took up residence in the Middle Ward of the Manor, named Hanover in 1760 after the new ruling House of England. [v] The main hamlet in the Hanover area was at the junction of what is now Crompond Road and Old Yorktown Road and was known as Crompond. Although the majority of the fighting eventually shifted to the south, Yorktown did witness a number of British raids on the local American encampments, especially during the years of 1779-1781. 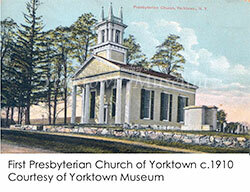 The Yorktown Committee of Public Safety used the Presbyterian Church on the corner of Crompond Road and Old Yorktown Road as a meeting place and arsenal for confiscated weapons. “On June 13, 1779, the British hearing that the parsonage and adjacent storehouse were being used to store arms, dispatched troops from Verplanck’s Point to raid and burn the parsonage and storehouse. [They] returned a few weeks later, on June 24, to destroy the church.”[vii] The church was reconstructed in 1785, and its congregation still meets today. Colonel Greene and Major Flagg were later buried at the Presbyterian Church cemetery on Route 202 and a marker has been erected in remembrance of the battle. “…A mass grave somewhere near the Davenport House accommodates the remains of an unknown number of black soldiers from Green’s Rhode Island regiment.”[ix] The Davenport House is listed as a historic landmark and is one of the last surviving Revolutionary War command posts in Westchester County. [x] The Historical Society is currently raising funds to build a monument in honor of the soldiers who fought in the Battle of Pines Bridge, which will be located across the street from the Presbyterian Church. [i] Cooper, Linda and Alice Roker. Images of America: Yorktown. Arcadia Publishing. Charleston, SC. 2003. Foreword. Crompond Road was a busy route even then with ox carts taking milk and product to Croton Point for river shipping to New York City, horse drawn mail wagons going between the river dock and the post office, and stage coaches between Danbury and Peekskill. The Civil War and the issue of slavery both affected American towns in the 19th century and Yorktown was no exception. New York State abolished slavery in 1827; however, the Fugitive Slave Act of 1850 made it illegal to assist a runaway slave. Bounty hunters roved the countryside, while the Underground Railroad ferried hundreds of former slaves north to Canada. “Due to the extreme danger and secrecy of helping escaped slaves move through Westchester, written records were seldom kept. Thus, little is known of how many citizens in Yorktown were “conductors” and provided safe “stations.””[v] The discovery of hidden tunnels and secret rooms in old houses such as Davenport House, has led locals to believe that Yorktown residents did indeed participate in the Underground Railroad. 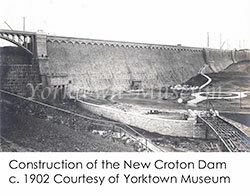 Residents of Westchester, including the powerful Van Cortlandt family,[x] fought the proposal to dam the Croton River, but despite their objections the dam was built. By June of 1842, New York City was celebrating the arrival of water from the 400 acre Croton Reservoir. In 1892, 1,750 more acres were acquired by New York City to enlarge the system, a new dam begun and additional bridges built. 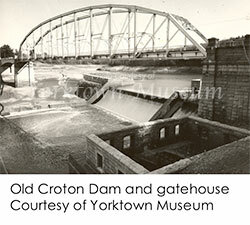 In 1907, the New Croton Dam was completed and tourists came to view one of the wonders of man’s handiwork. The original dam and pump house (now submerged) are still partly visible when the reservoir is very low. 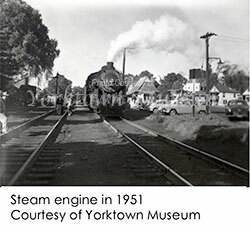 At the end of the 19th century, the railroad arrived in Yorktown, spurring economic development and carrying vacationers north for summers in the countryside. Regular service began in 1877, and business quickly began to concentrate at the railroad plaza. 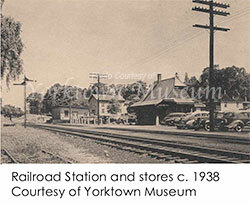 On August 27 Aaron Clark opened the first shop south of the depot and the town soon “consisted of five stores, more than a dozen homes, a schoolhouse, a hotel, two blacksmiths, a wheelwright, and two churches.”[i] In 1888, the railroad constructed the present passenger station in Yorktown Heights, which is now listed as a National Historic Landmark. The agricultural economy flourished as farmers could now ship large quantities of milk and produce to the markets in New York City. 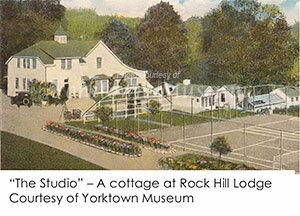 Yorktown quickly developed into an agricultural breadbasket of Westchester County. The railroad also made it possible for others to commute to the city for work. A year’s commutation, 1890 style, cost $90. After a number of changes in ownership, the New York Central took over in 1896 and the line became the Putnam Division, but locals and passengers would endearingly refer to it as the Put. The railroad also helped to introduce many newcomers to the area. 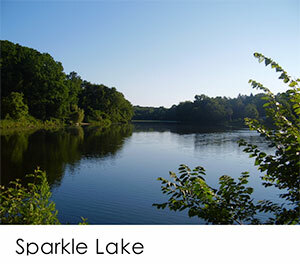 New York City residents would come north for the summer, attracted to the abundant lakes, forests and wildlife. “The many orchards and dairy farms offered a pastoral setting for these seasonal transplants.”[ii] Summer colonies and hotels sprang up around the lakes of Mohegan, Shrub Oak, and Osceola. The rapidly increasing prevalence of automobiles and the construction of the Taconic State Parkway in 1931[iii] also encouraged vacationers to come north for a week or more. The last passenger run on the Putnam line was on May 29, 1958. 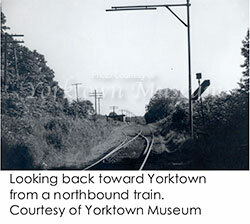 The railroad was forced to add extra cars because “many people turned out to bid the Put a fond farewell.”[x] At this point, Yorktown was already transitioning into the bustling suburb it is today. In the years after World War II many of the local resorts began to disappear as more and more people were coming to stay. People moved north from the city in droves and residential areas rapidly replaced farms to accommodate large numbers of new residents. Census figures illustrate the rapid growth: 1950 – 4,731; 1957 – 11,804; 1960 – 21,235; 1974 – 32,000. The peak year for construction starts was 1955, when 564 new building permits were issued. Jefferson Valley was transformed as well as orchards and dairy farms were replaced by housing developments. “In 1957, the Lakeland Central School District built Thomas Jefferson Elementary School. Eight years later the new Route 6 was constructed, altering Jefferson Valley forever.”[ii] In 1983, the 900,000-square-foot Jefferson Valley Mall was constructed along Route 6 in the center of the hamlet. The early 1970s witnessed a dramatic slowdown in the amount of new construction due to economic conditions and increasing concern about the environment, open space, and preservation. The town’s focus turned to community planning and development. The abandoned Commerce Street School was transformed into the Yorktown Community and Cultural Center, and today it houses the Yorktown Planning Department, nutrition and teen and day care centers, a dance school, Yorktown Stage, and the Yorktown Museum. 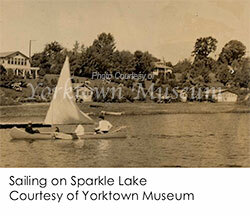 During the town’s Bicentennial in 1988, Yorktowners took stock of their historic heritage and commemorated their community’s participation in the events that lead up to the birth of our nation. A Bicentennial Committee reviewed the Town’s still remaining historic sites and determined which were to be preserved as a reminder of that past and as a link between the Yorktown of yesterday and the Yorktown of tomorrow. The old railroad depot and its surrounding area were refurbished and rededicated as Railroad Park in 1999. It sits adjacent to the former Putnam Division line, which is now a part of the North County Trailway, open to pedestrians and bikers who can enjoy the scenic beauty of Northern Westchester along its historic route. Yorktown today is primarily a suburban community within the Greater New York City Metropolitan Area. Its character is predominantly residential, with a major portion of its workforce commuting daily to jobs in New York City, White Plains and other locations in Westchester County. 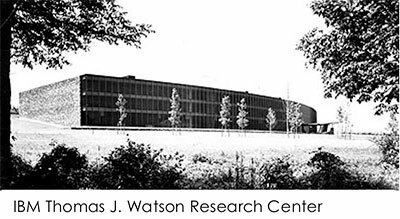 The major industry is IBM, which as two laboratories within the town. Smaller industrial businesses are situated in industrial parks located in various parts of Yorktown. Commercial businesses are concentrated in the five hamlet areas that make up the town – Yorktown Heights, Shrub Oak, Jefferson Valley, Crompond, and Mohegan. The number and variety of commercial enterprises has grown with the increased population of the town so that the community has become self sufficient for most of its needs. Yorktown’s population is still increasing, but at a slower rate than it did a decade ago. Town officials and concerned citizens are increasingly aware of the importance of carefully planning the future development of our remaining undeveloped land so as to insure a sound and healthy environment for all Yorktowners.